When you have completed building your application form in WizeHive, it's important to conduct thorough testing before going live. You will want to access your form as an applicant would and go through the full process of logging in, answering all questions, testing Rules (where applicable), and submitting. You will also want to test any workflows based on a New Submission by going into your workspace after submitting and seeing that the application moved to the expected folder. The below is a step by step guide to assist you in testing your form. You will want to make sure that the application is open so that you can access the URL and test it. If your URL is already iFramed on your website or linked to from your website, then you will want to temporarily change your URL and adjust your dates so that the application is open. Once there, first go to the URL area and change the form slug to something that no one could easily identify. You will be able to change this back after testing. Scroll down to the bottom of the form settings to the Advanced Settings area. Make sure that today's date/the dates of the testing period fall between the Start and End Date. If your application URL has not yet been placed on your website or made public, then there is no need to change the URL. However, do make sure that the dates are set up such that your application is open. Once your URL and dates are set, you will want to access the application URL and create test credentials. Your URL is found at the top of your form settings. You can click the Go to Application button in order to open up the URL in your browser. However, please note that acting as both an applicant and an administrator in the same browser may cause a session issue and could cause you to be logged out of WizeHive. It is recommended that you access the application in a separate browser. When you open the URL, you will be brought to the Sign Up/Log In page that your applicants will see. You will want to Sign Up. You can use your own email address and create a memorable testing password. 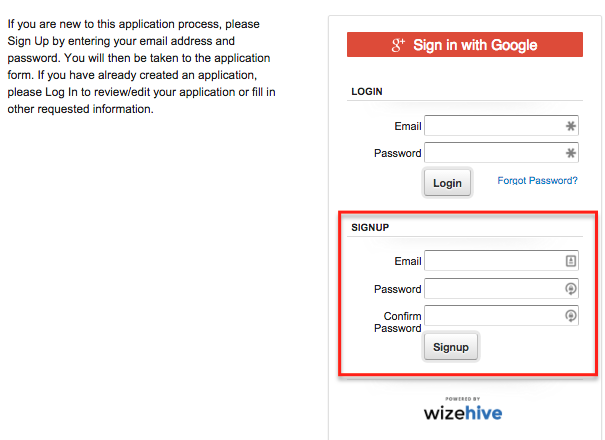 The credentials you use for the WizeHive system will not work here, so you will not be able to enter them in the Log In portion. You will need to Sign Up and create a new applicant account here. 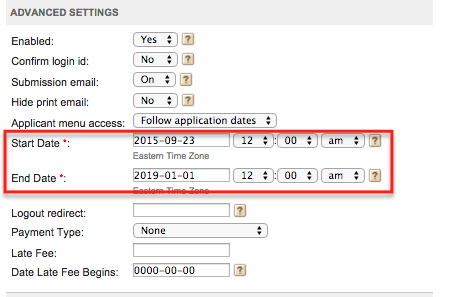 Required Fields: Try skipping required fields to make sure that the system gives you an error message when you try to submit. Field Validation: If you have a field marked Numeric, try entering a non-number here and submitting so that you can test receiving an error message. Likewise for fields marked Email Address, Zip Code, Currency, etc. Read Only: If you have a field marked Read Only, make sure you are not able to enter text into that field. Please note that if you are accessing the form in the same browser in which you are logged in as an administrator, it may still allow you to enter text. Therefore, it is highly recommended to test the form in a separate browser. Upload Fields: If you have designated a particular upload field as only accepting JPG, try uploading a file other than JPG to make sure you are presented with an error message. Word Count: If you have set a field to accept a limited number of words, try to enter more than that number. Suggestion: you can copy and paste text from another source so that you don't have to type 200 words out. If the limit is 200, you should be unable to go over that amount. Rules: If you are utilizing Rules in your form, make sure they work. Try different combinations of responses to the trigger field to make sure that the expected fields show/hide according to your responses. Pages: If you are utilizing Page Breaks, make sure that the pages break where expected. Email Confirmation: Once you have gone through the full form, click Submit. You should receive an on screen confirmation and email confirmation at this point. 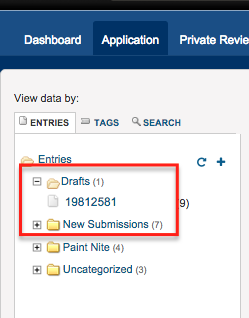 If you are not using custom workflow, the system has one built in workflow that will move applications from the Drafts folder to the designated New Submissions folder. Once you have submitted your application, you should go into your workspace and see that your application now resides in the New Submission folder. Before submitting, it is recommended that you also go to the workspace to see that your draft application is in the Drafts folder.